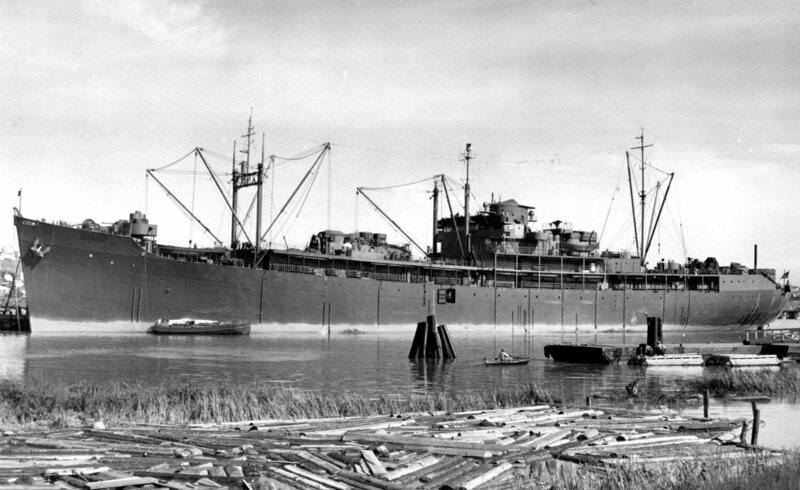 Laid down, 8 May 1939, as MV Mormacyork, a Maritime Commission type (C3) hull, under Maritime Commission contract (MC hull 45), at Sun Shipbuilding and Dry Dock, Co., Chester, PA. 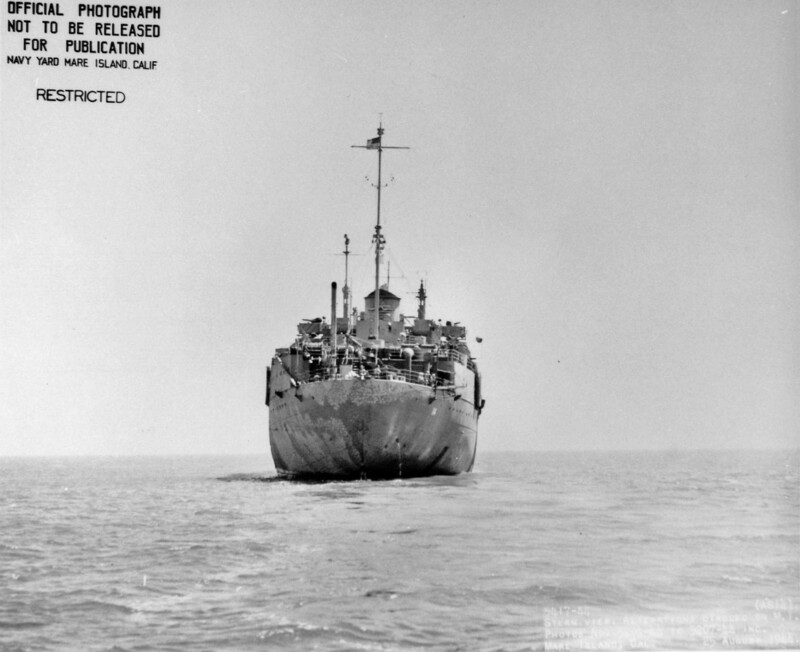 Delivered, 1 April 1940, to Moore McCormack Lines, Inc.
Acquired by the Navy, 15 November 1940, from Moore McCormack Lines, Inc. 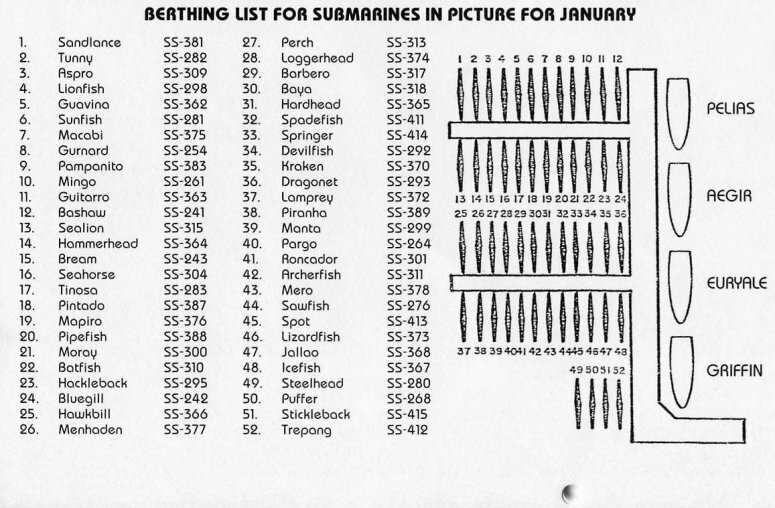 Converted to a Submarine Tender at Bethlehem Steel Co., Brooklyn, N.Y. 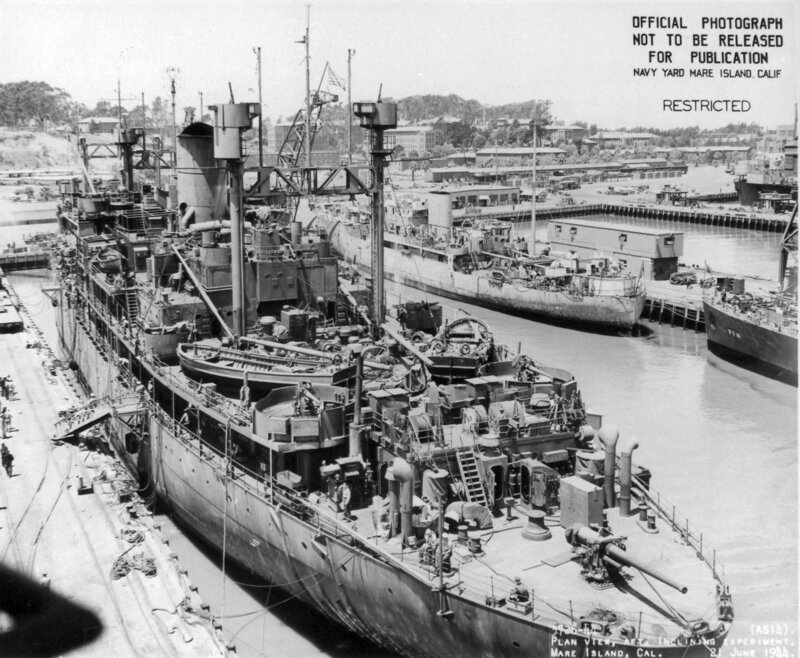 Reduced status to In Commission in Reserve, 6 September 1946, at Mare Island Navy Yard, Vallejo, CA. 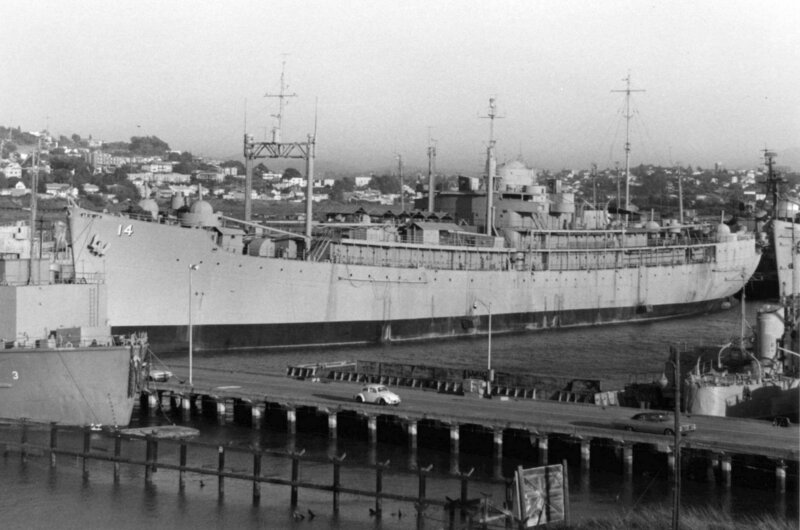 Decommissioned, 14 June 1970, at Mare Island Navy Yard, Vallejo, CA. 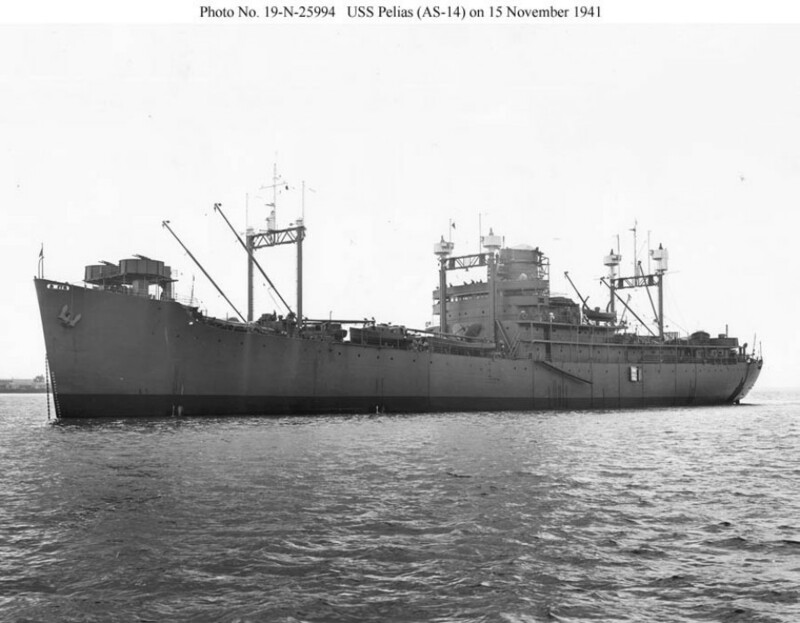 114k USS Pelias (AS-14) near Mare Island Navy Yard, 15 November 1941. The rig of this class as completed consisted of three heavy goalpost masts, two of which carried AA gun positions. 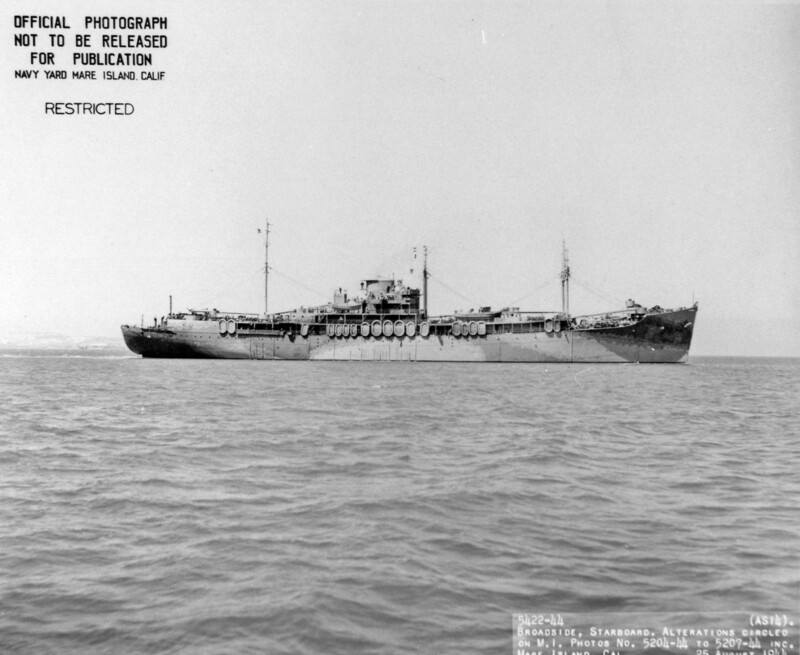 84k USS Pelias (AS-14) near Mare Island Navy Yard, 5 March 1944. The ship has undergone essentially the same major reconfiguration as her sister USS Griffin (AS-13). Her stacks retains its distinctive cap, which Griffin lacked. 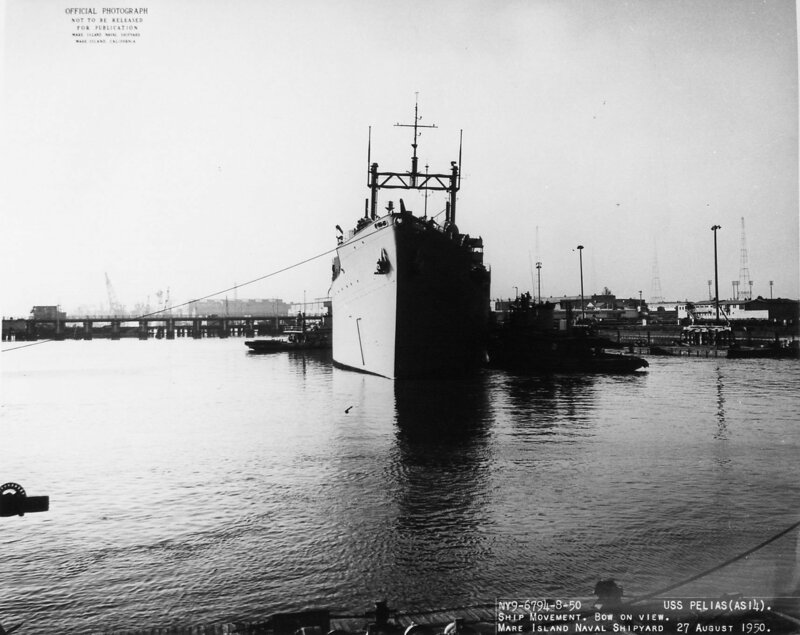 371k Bow view of USS Pelias (AS-14) at Mare Island Navy Yard, 21 June 1944 while undergoing repair and modification. Ships at the opposite pier are the French Frigate Cap Des Palmes (left) and USS Grand Island (PF-14). 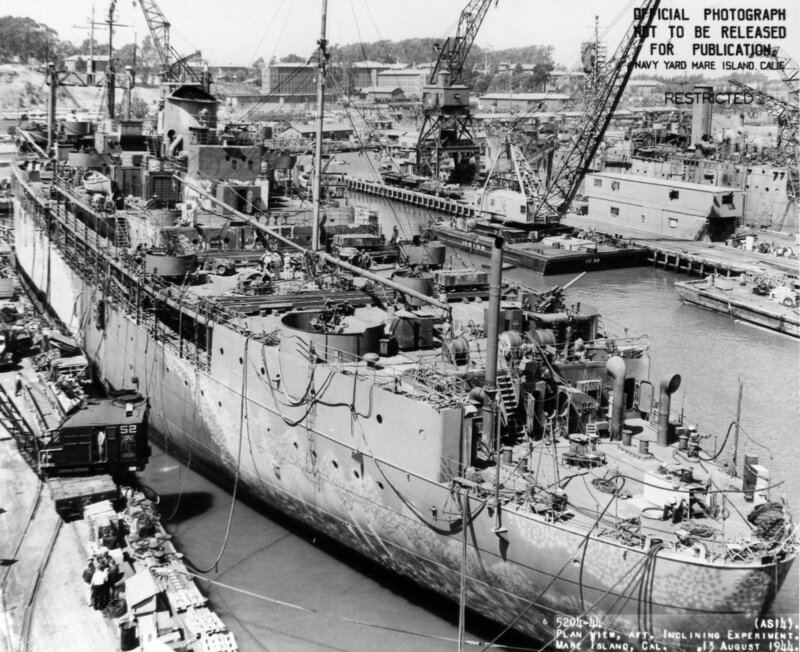 402k Stern view of USS Pelias (AS-14) at Mare Island Navy Yard, 21 June 1944 while undergoing repair and modification. Ships at the opposite pier are the French Frigate Cap Des Palmes (left) and USS Grand Island (PF-14). 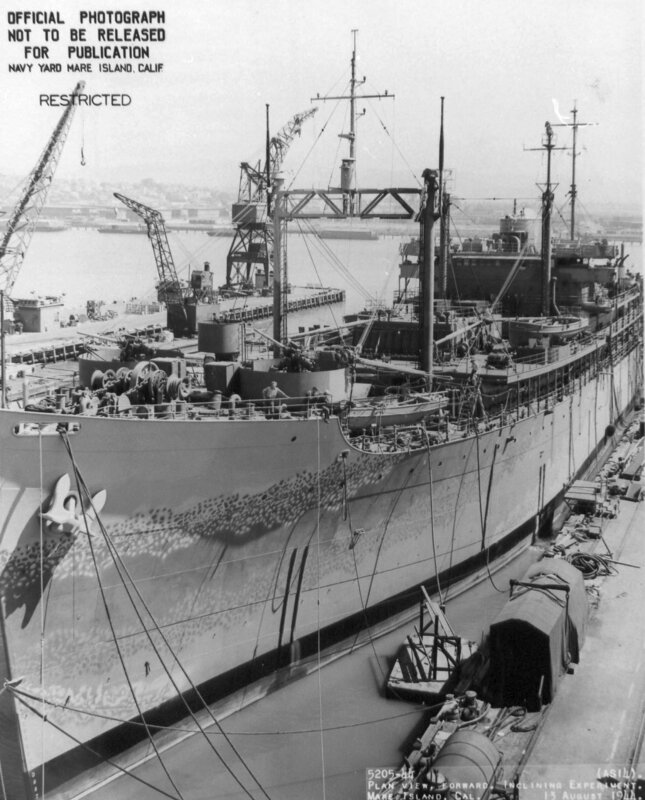 477k Stern view of USS Pelias (AS-14) at Mare Island Navy Yard, 13 August 1944 while undergoing repair and modification. YD-98 and the a small portion of YD-84 are seen at the opposite pier (south side) with the USS Vestal (AR-4) on the north side of the pier. 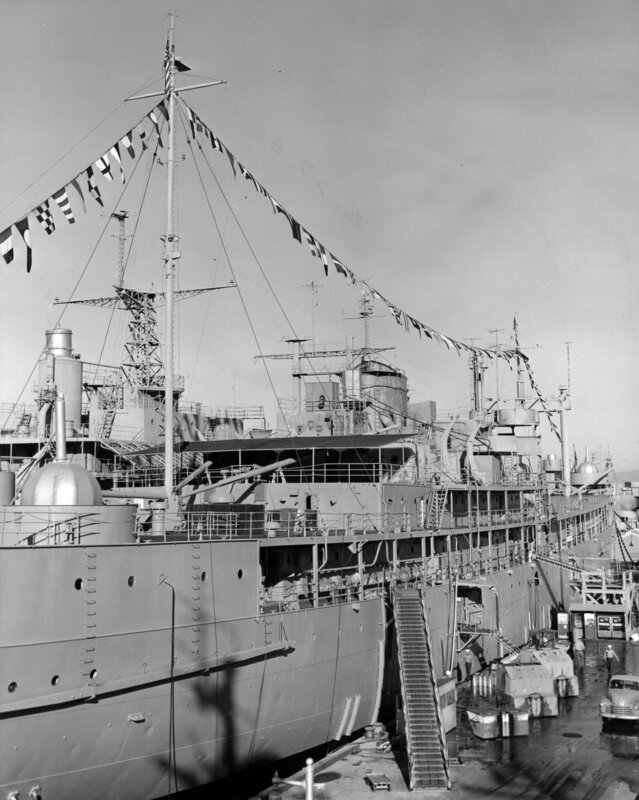 321k Bow view of USS Pelias (AS-14) at Mare Island Navy Yard, 13 August 1944 while undergoing repair and modification. 212k Stern view of USS Pelias (AS-14) on trials after modifications at Mare Island Navy Yard, 25 August 1944. 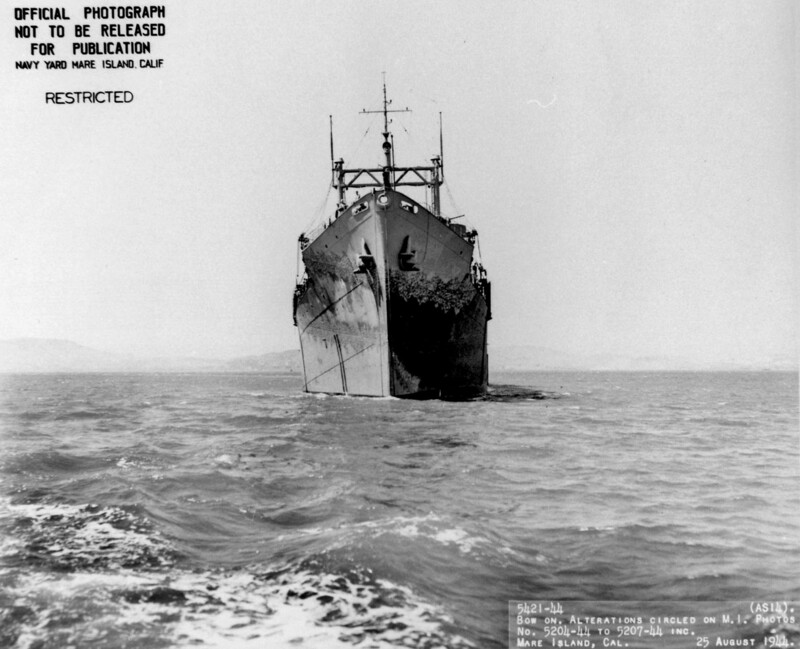 250k Bow view of USS Pelias (AS-14) on trials after modifications at Mare Island Navy Yard, 25 August 1944. 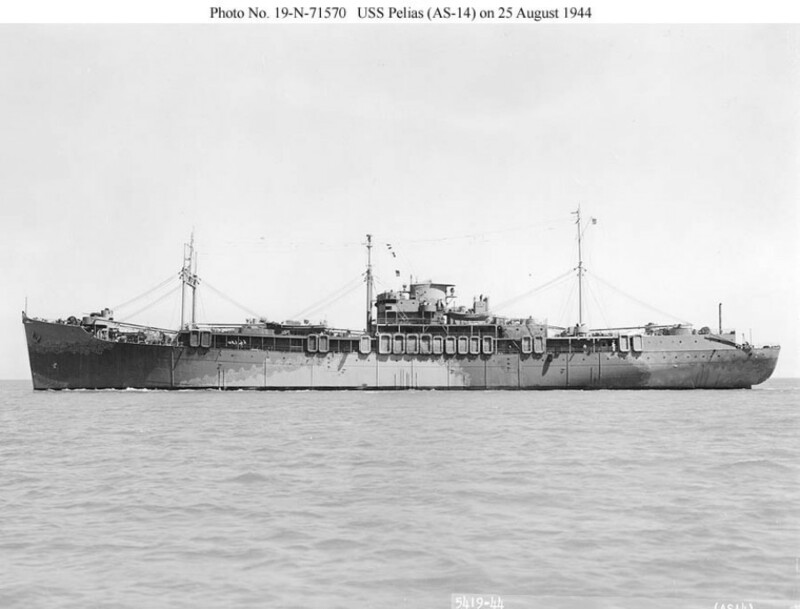 225k Broadside view of USS Pelias (AS-14) on trials after modifications at Mare Island Navy Yard, 25 August 1944. 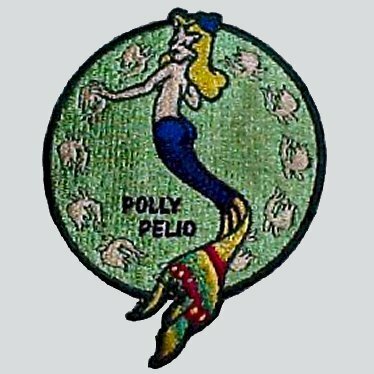 Note Pelias is painted Camouflage Measure 32, Design 10Ax. 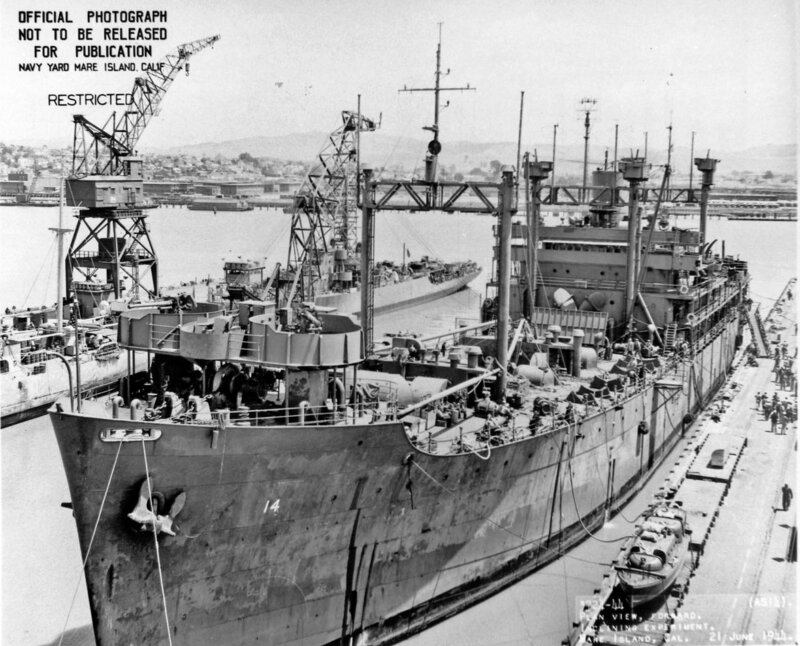 263k Broadside view of USS Pelias (AS-14) berthed with the Mare Island Reserve Fleet in March 1946. 313k USS Pelias (AS-14) entering the reserve fleet at Mare Island, 26 August 1950. 484k USS Pelias (AS-14) in full dress for Navy Day at Mare Island Reserve Fleet, 27 October 1960. 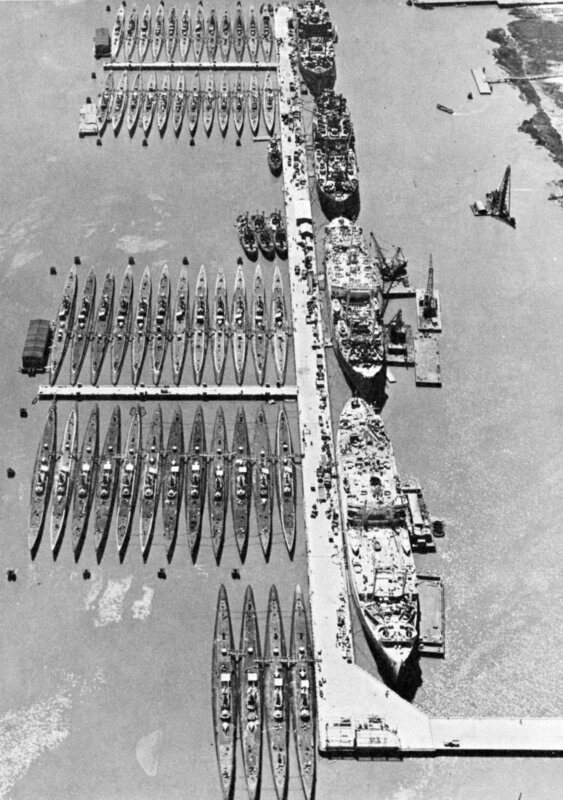 885k Mare Island Reserve Fleet, June 1967. Recognizable ships include USS Pelias (AS-14), USS Vanderburgh (APB-48), APL-3 (inboard of Vanderburgh), and USS Pine Island (AV-12) in the background. 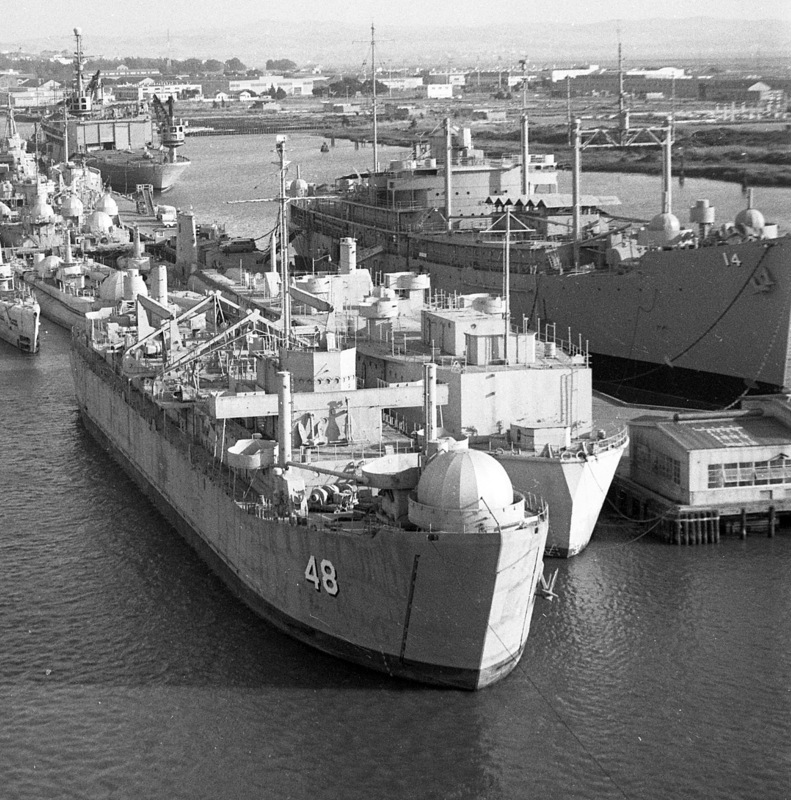 397k USS Pelias (AS-14) in reserve at Mare Island, circa 1969. 375k Acania at Mare Island Reserve Fleet, 27 June 1971 with USS Pelias (AS-14) is in the background. 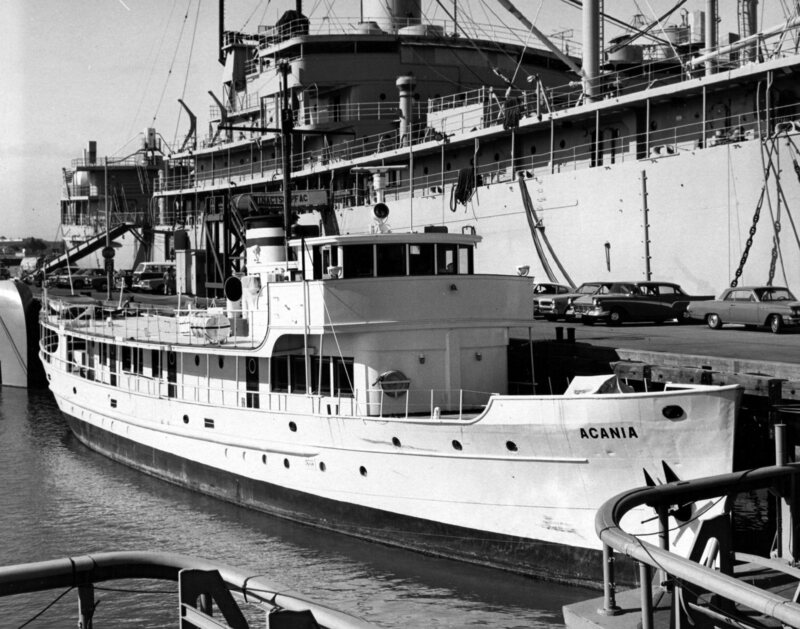 Acania had a varied career which included service with the Coast Guard, Stanford Research Institute, DOD- Atomic Support Agency and the Navy Postgraduate School. There is no record at Navsource to indicate she was ever assigned a hull number.